“The gap between perception and reality is understandable following such a deep recession,” says economist Trevor Tombe. Alberta's recession is now long over. The latest data from Statistics Canada, released Wednesday, shows 2017 was a year of strong economic growth. Gains in the province's oil and gas sector were particularly high, driving half the gains for the year. But, after 18 months of economic recovery, the province remains divided between those who see it and those who do not. Recent polling by CBC Calgary's The Road Ahead series uncovered significant apprehension about the province's economy. Over one in three see it moving sideways, while another one in five see it getting worse. Combined, a slight majority of Albertans do not believe a recovery is underway. But the data tells a starkly different story. It reveals a broad and persistent recovery, shared by most (but not all) Albertans, and an economy that is still second to none in Canada. The gap between perception and reality is understandable following such a deep recession, and it will take some time to close. Of course, for many, perception is reality and may reflect where we think we should be, rather than where we are or were. But misdiagnosing our current situation risks favouring policies that do more harm than good and leaves us open to political manipulation as we look to the next election. Employment (up 3.5 per cent from its bottom in the recession). Earnings (up 6.9 per cent). Wholesale trade (up 16.3 per cent). Manufacturing (up 25.5 per cent). Exports (up 46.5 per cent). Retail sales (up 0.7 per cent). EI recipients (down 42.2 per cent). Or I could point to broader measures of economic health: GDP growth in 2017 was 4.9 per cent, the highest among Canada's provinces. A comprehensive index of economic activity compiled by the government has recovered three-quarters of its recessionary loss. And, per person, no other economy in Canada produces more. But these are just abstract statistical data. How do they matter for real Albertans? There are nearly 40 per cent more open job vacancies than one year ago — and fewer unemployed workers competing for them. The unemployment rate is down to 6.3 per cent, from a 2016 peak of nine per cent. The situation is better across the province. In Red Deer, unemployment is down from 9.5 per cent a year ago to 4.9 per cent today. In Camrose and Drumheller, from 9.9 per cent to 3.9 per cent. In Wood Buffalo, from 9.1 per cent to 5.7 per cent. Edmonton, from 8.8 per cent to 6.8 per cent. And in Calgary, from 9.1 per cent to eight per cent. Though Calgary's unemployment appears to be recovering more slowly than elsewhere, this is not cause for alarm. As more workers enter the labour force and begin searching for work — instead of staying home, discouraged — the unemployment rate rises. 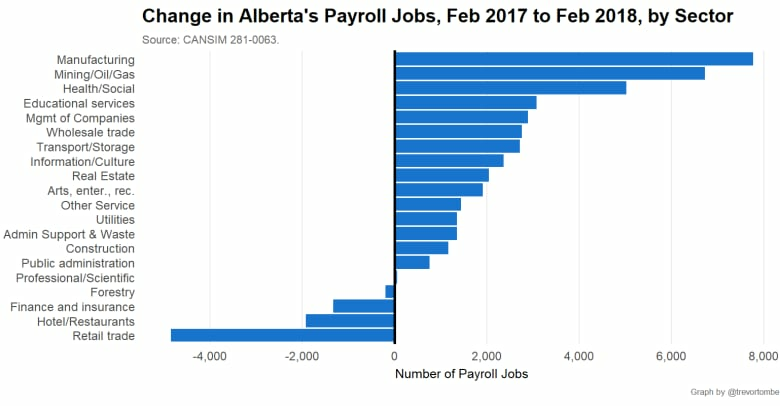 In Calgary, because of this, recent employment gains are stronger than the modest drop in the unemployment rate suggests. And across the nearly 300 different ways Statistics Canada defines and groups sectors in Alberta, two-thirds have more jobs today than one year ago. Even employment in the hard-hit oil and gas sector is up by nearly 7,000, and manufacturing up nearly 8,000, though retail, hotels and restaurants, and finance are down. Earnings are also pointed in the right direction. 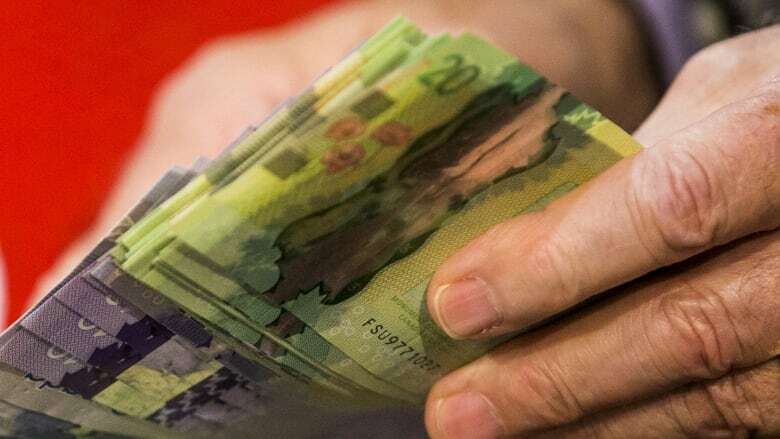 Alberta workers earn, on average, more than $1,158 per week. This is not only higher than any other province, by far, but is $52 more per week than when the recession ended in October 2016. Almost every industry is seeing average wages grow, and three-quarters of the job gains mentioned earlier were in sectors with above-average weekly earnings, such as in resources, utilities, construction, and manufacturing. Even newly hired workers are being offered more. 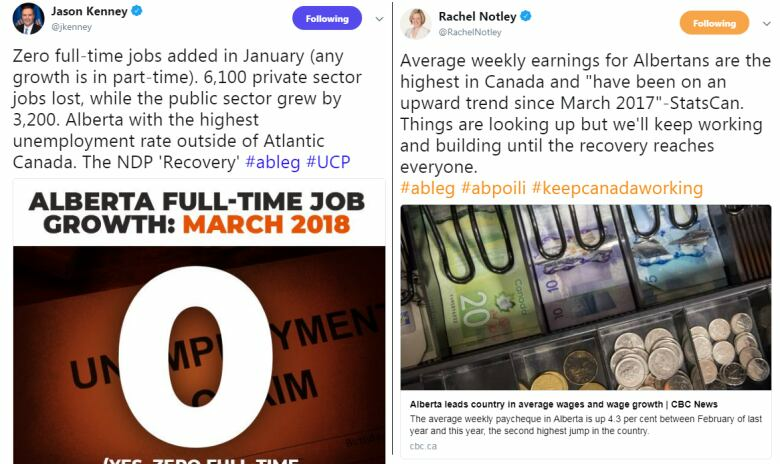 The average offered wage of vacant positions in Alberta was $22.05 an hour at the end of 2017 (the latest data), compared to $20.45 a year ago and $19.15 the year before that. Put all this together, and there's more money in the pockets of Albertans. 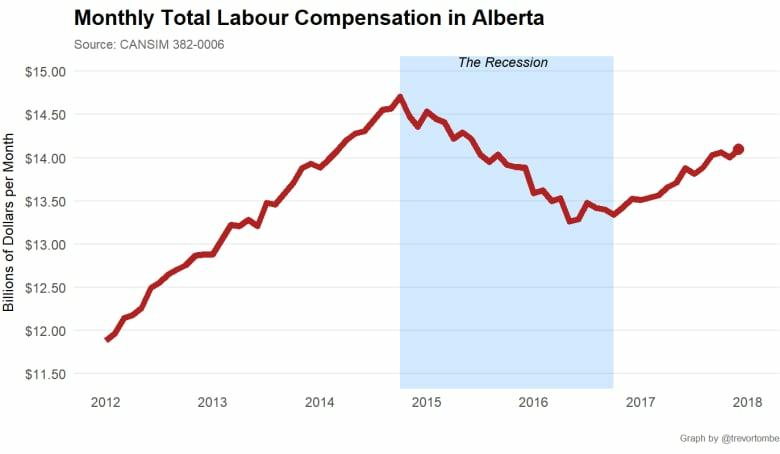 Total wages, salaries and benefits paid to Alberta workers was $830 million more per month at the end of 2017 than at the bottom of the recession. In the same poll cited earlier, more than 70 per cent of Albertans feel Canada's equalization system is unfair. The system gives nothing to Alberta, despite its large provincial deficit, while giving billions to other provinces. But this misses that equalization is effectively a program to top-up provinces with weak economies. That's not Alberta. Not even close. Compared to other provinces, Alberta remains on top. A higher share of our population is employed than elsewhere and our overall economy produced roughly $80,000 per person in 2017. The second strongest economy (Saskatchewan) produced $69,000, according to the Conference Board of Canada. Here, our large deficit is not due to a weak economy but on our choice to rely on royalties to fund high spending and low taxes. Our deficit is a critical challenge. But it is for us to solve, not Ottawa. So, if recovery is so clear and the economy so strong, why do most Albertans not see it? What drives the gap between perception and reality? First, we aren't fully recovered. Despite having the strongest economy in Canada, Alberta remains below its 2014 peak. If that is one's reference point, then today's situation is far from ideal. Second, the recession was massive. Alberta's economy bottomed out in 2016 with perhaps $130 billion less economic activity than it would have if pre-recession trends continued. Even as the recovery proceeds, the pain from such a shock still lingers. Third, though the gains are broad, they are not universal. Young men in particular are having a very difficult time, as I explored in a recent CBC article. As well, social assistance rates remain near historic highs. And business investment has yet to recover. Finally, partisanship is partly to blame. This concerns me most. Leaders on both sides struggle to control the message. The opposition highlights the bad news while the government exaggerates the good. And since sifting through data takes time, we rightly take cues from those we trust to lead. There's strong evidence for this in the United States. The Pew Research Center finds 74 per cent of Republicans saw the economy as good or excellent in March, up from only 14 per cent at the end of president Obama's term. Democrats displayed the reverse pattern, though not as large. In Alberta, CBC focus groups found those on the right used words like "slow" or "directionless" to describe the economy, and frequently say it is "held hostage" by those opposed to resource development and pipelines. Those in the centre or on the left seem less pessimistic. Such sentiment is understandable, and trusting leaders is entirely natural, but we mustn't be led too far astray or direct our anger in unproductive ways. We might be led to support stimulus spending that isn't needed, or diversification policies that are poorly defined, or blame the economy for a deficit that is really a choice, or — worse still — blame a government or a policy for a condition we don't have. This doesn't imply that all is well and no improvement is possible. But we must properly define and diagnose a problem before we can hope to solve it. Even if many do not yet feel it, Alberta's recovery is real and its economy is strong. Calgary: The Road Ahead is CBC Calgary's special focus on our city as we build the city we want — the city we need. It's the place for possibilities. A marketplace of ideas. So. Have an idea? Email us at: calgarytheroadahead@cbc.ca. This column is an opinion. For more information about our commentary section, please read this editor's blog and our FAQ. 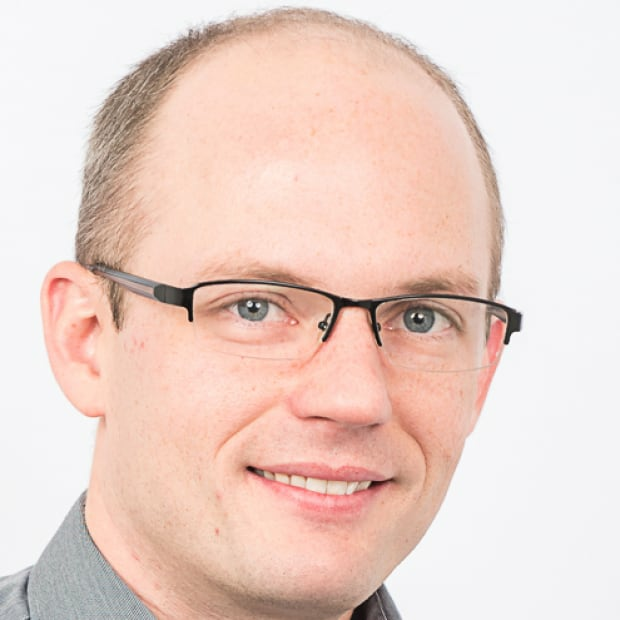 Trevor Tombe is an associate professor of economics at the University of Calgary and research fellow at the School of Public Policy.